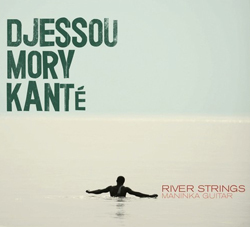 I first became aware of Guinean guitarist Djessou Mory Kanté in a series of spare recordings made by Günter Gretz for his obscure but wonderful Popular African Music label in the 1990s. He played with his older brother Kanté Manfila on the legendary Kankan Blues, and on sessions with Grand Papa Diabaté and Sona Diabaté. He also did his first recording as a front man for the label, Guitar Séche. Living in Paris, he has gone on to greater fame as an in-demand guitarist for super stars like Salif Keita, and most recently did guitar work and arranging for Sékouba Bambino Diabaté's The Griot's Craft. So it's not like he just came out of nowhere this year with this remarkable album of instrumental works for his chosen instrument. Nonetheless, the album is hitting many listeners, including me, like a gentle bolt of lightening. River Strings brings this artist into a sonic space that is near perfect. A clean, clear recording technique buoys the performances, and a spare ensemble of guitars, ngoni, bass, keyboards and percussion carry it all simply and beautifully. It was all recorded in two studios in Bamako in 2012 and mixed in 2014 by Iain Scott and Ben Turner back in Weymouth, UK with openness and clarity. And the music, you ask? They break right out with "Coucou," a Keita and Manfila composition the immediately sets the pace for the entire performance. It's laid back, a virtuosity that does not depend on flash or effects, but on melody and rhythm; on a groove created by the intuitive interplay between Kanté and bassist Kerfala Kanté, in particular. There are more fully arranged pieces like the funk and blues inspired "Laban," a fine meeting of guitars with the legendary Djelimady Tounkara on "Toubaka" and the percussive insistence of "Denya" and "Djandjo" (which again features Tounkara). But it is on Kanté's own "Fakoly" that I realized why this recording hooked me so solidly. The layers of guitars are unique: each is carefully placed and given enough space to breathe, the whole becoming so much more than the parts. The rhythmic interplay of the backing guitars gives it an unusual feeling, seeming off kilter until your brain puts it all together and it suddenly makes perfect sense. There's little staccato punches of organ, the bass line snakes around one minute and then just plays out a simple line the next. It's sweet chaos. The deepest traditionalist moment comes in "Harouna," where the acoustic and electric guitars are intertwined with kamala ngoni in an endless stream of pure simplicity. It's like sitting on the dock and listening to a river full of notes just flow by, sometimes pattering against the pilings, other times punctuated by a splash out there somewhere in the center. It has no real beginning or end; like a river, it's just there, never changing and yet constantly new.